Home Expert Advice Skincare Advice Acne & Breakouts Does Tea Tree Oil Help Acne? In addition to the research-proven over-the-counter products that contain benzoyl peroxide and salicylic acid, there are a handful of natural ingredients to combat acne, of which tea tree oil is the most common. The question is whether or not a tea tree oil acne treatment is worth trying; if so, that leads to the next question: How do you use tea tree oil for acne? As it turns out, tea tree oil does have some benefit for acne-prone skin—if you use the right concentration. However, conclusive research has not shown tea tree oil to be significantly better than a 5% concentration of benzoyl peroxide. It’s also no match for the results possible from a leave-on exfoliant with 2% salicylic acid. Also of note: Benzoyl peroxide and salicylic acid are U.S. FDA-approved active ingredients for acne; tea tree oil does not have this distinction. 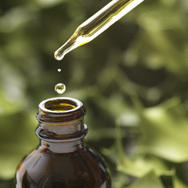 Pure tea tree oil is extracted from the leaves of the tea tree. Its herbal, slightly medicinal scent includes a mix of over 100 compounds! Some of these compounds are believed to calm factors in skin that contribute to how acne looks and feels. Research has shown that application of a 5% concentration of tea tree oil can reduce the number of papules and pustules—both types of pimples that people with acne usually experience. How Much Tea Tree Oil Do You Need? The concentration is the sticking point: The highest concentration of tea tree oil we’ve seen in a cosmetic product is less than 0.5%, far below what research has shown is needed for skin to benefit. The “straight” tea tree oil found in health food stores is typically a 3% concentration diluted in a carrier oil, so even that isn’t strong enough, despite the “100% tea tree oil” statement you might see on the label. If you can find a strong enough concentration of tea tree oil, it’ll likely be too strong, which can trigger a sensitized reaction if you don’t dilute it before applying to skin. Among the 100 compounds in tea tree oil are fragrance ingredients like limonene, linalool, and eucalyptol, all believed to be responsible for skin reactions to tea tree oil. Our advice? Why take the risk or go through the guessing game of dilution when other over-the-counter (and many prescription) acne products can work with greater certainty? What if you still want to try tea tree oil for acne? We understand the pull, especially if other acne skincare products haven’t worked the way you hoped. If you decide to try tea tree oil, proceed with caution and stop using it if you see signs of irritation. Wash your face with a gentle cleanser for breakout-prone skin. Apply a leave-on anti-acne treatment with 2% salicylic acid. Dispense a few drops of tea tree oil onto a damp cotton swab and dot it directly on blemishes. Alternatively, you can mix 5–6 drops of tea tree oil into a lightweight facial moisturizer and apply it to your entire face. Don’t apply a benzoyl peroxide product until you know how your skin responds to the tea tree oil. As with any skincare routine, protect your skin every morning with a broad-spectrum sunscreen rated SPF 30 or greater.